Evidence points to earliest habitation of the Carlingford region some 7,500 years ago. It may have come as late as two thousand years later. In the broader world view this period, marked by a shift in the manufacture of stone tools from microliths (small stone blades) to larger and more diverse tools – such as the Bann flake – is labelled the Mesolithic Age. Earlier evidence of Mesolithic settlements has been uncovered in North-East Antrim, along the lower Bann River and in the Strangford Lough area, with an abundance of tools from adequate quarries. It is possible that these early settlers followed the path of the retreating ice sheets towards Carlingford. Excavated Mesolithic sites such as Rockmarshall, near Dundalk, contained evidence of later Mesolithic tools and seafood remains [such as oysters and periwinkles]. The later date quoted above (c. 3,500 B.C. or 5,500 B.P.) was determined from radio-carbon dating of a charcoal sample from this site. Evidence from this and another site near Greenore indicate that such sites were in use up until the advent of agriculture in the region. It has been intimated that these were not habitually occupied but rather were production sites for such tools before these were transported elsewhere. With later Mesolithic stone axes from Warrenpoint and Kilkeel, they can be placed firmly in the Larnian culture. The whole Carlingford Lough region is thought to have been low in Mesolithic activity in comparison with Strangford and Belfast Lough. The naturally occurring flint outcrops were of fairly low quality and incapable of supporting a large Mesolithic population. 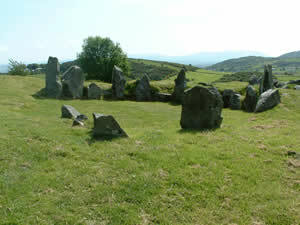 Evidence from such sites as Mount Sandal in Antrim indicates a probable diet of hare, dog, birds and fish. At the middens of Rockmarshall there is evidence that this diet was supplemented with a variety of shellfish and sea life. Carlingford and the Mournes could also have provided berries and nuts in season, and wild boar. All this, with the local abundance prompts Fintan Walsh to conclude that a local population prospered at Rockmarshall into the Neolithic Period, when the clear evidence of a developed civilization was marked by the presence of numerous court tombs. These court tombs – characterized by an extensive ‘courtyard’ area near the entrance and before the enclosed and capped rear area – are found not only extensively in the Mourne and Cooley areas but throughout Ireland and beyond. Our study area has been featured in terms of the individuality of its Neolithic activity and has lent its nomenclature – the Carlingford Culture – to the whole of the Irish court tomb series of the Neolithic [Bagnall 1984]. With the lack of evidence of settlement sites, these portal and court tombs, with evidence from artefacts found there, take on additional significance in our attempts to understand the social organisation of these people. Unfortunately such artefacts sometimes date from more recent times, as the tomb areas were frequently used as later burial sites. The late Mesolithic shows little evidence of external contacts [Woodham 1999] but the fact that even then Ireland had long been an island indicates that new Neolithic ‘continental’ agricultural practices such as domestication of feed animals and cereal crop production had to be physically imported across the water. It is believed [Case 1969] that at the beginning of the Neolithic, recent arrivals lived fairly separate from the native and earlier settlers and that it was not until the middle Neolithic that integration of these people occurred. The spread of agriculture and the anthropological artefacts of Neolithic culture such as pottery, megaliths and other flint works probably followed the movements of peoples and communities. It was thus determined by opportunities for travel and dependent on the available means of transport. It is believed that sea worthy vessels of the fourth to the third millennia B.C. were made from skins and were slightly larger than the canvas curraghs still used occasionally on Ireland’s western seaboard. It has been estimated that a boat of 23 feet length could have carried nine people, or in proportion, two adult cows, two calves, six pigs, ten sheep or goats and two dogs [Case 1969]. It is possible that ideas were spread also, not by migrating whole communities, but by a leading few members travelling on outreach missions in search of new resources [Waddell 1978]. Clarity is impossible until even the order of appearance of certain agricultural plants, for example, is determined. There remains great debate too over the origins and dating of portal and court tombs. Some suggest that they originated in western France and thus represent a major early colonisation of Ireland, with a possible landfall in Mayo, where many court tombs are concentrated [De Valera 1965]. It is alternatively suggested that court tombs were introduced to eastern Ireland – and notably the Carlingford region – from the Clyde area of Scotland. The design of the area’s tombs, with a long cairn, forecourts and segmentation, lend credence to this theory. Differences lie with methods of interment and with grave furniture. This theory is expanded with proposed westward expansion, until with no further westward movement possible, the proliferation of tombs in the west. Waddell [opt. cit.] and others propose a linkage with the earthen long barrow tradition of Britain. There are insufficient radiocarbon dates from artefacts from Carlingford tombs to come to any definitive conclusion.